“Fiasco” was the word chosen by a glaciologist in an e-mail alerting his colleagues to false claims made by the latest edition of Times Atlas of the World. 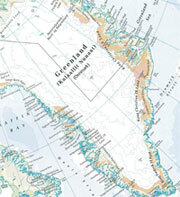 A map of Greenland in the atlas shows a significant portion of the polar country’s coastline had become ice-free (see map). During its lunch on September 15, its publisher, a Harper Collins subsidiary, issued a press release saying Greenland had lost 15 per cent of its snow cover from 1999 to 2011 due to global warming. Glaciologists at the National Snow and Ice Data Center in the US acted as a truth squad, reported The New York Times. On blogs, on radio programmes and in newspaper columns, they stated emphatically that Greenland has retreated just one-tenth of 1 per cent in recent years, not 15 per cent as claimed. The publisher has apologised for the press release and says it is “urgently reviewing” the map and will soon update it.